Have you heard of Ebates? How would you like to get cash back on your everyday purchases on top of making extra money? I love getting cash back on things I would purchase anyway. 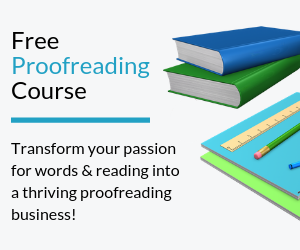 It’s free to use and money back in my pocket. What’s not to love? 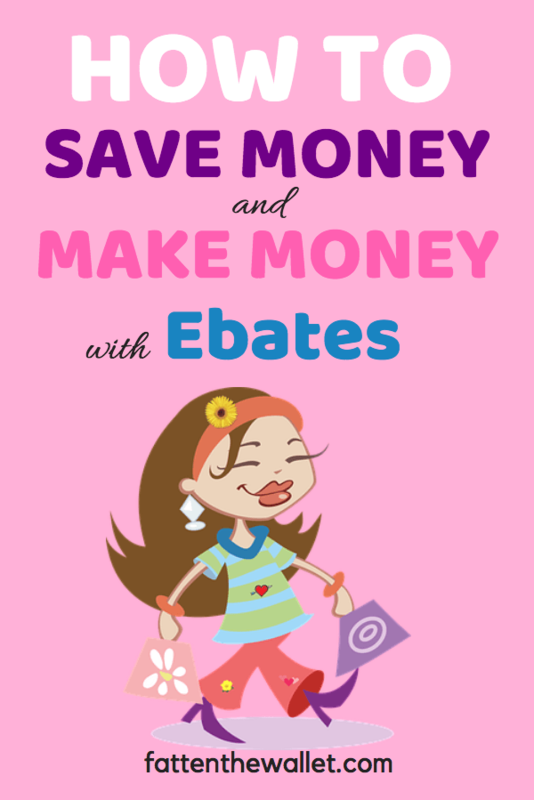 If you haven’t heard of Ebates then you’ve been missing out! 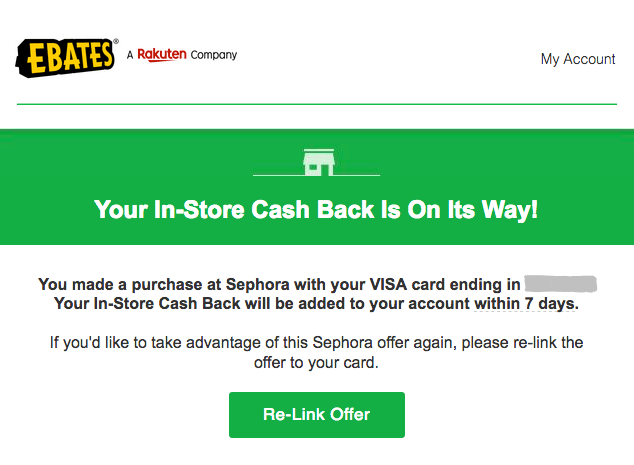 Ebates is my favorite cash back website/app to use. By signing up now, you get $10 bonus Walmart gift card after spending your first $25. 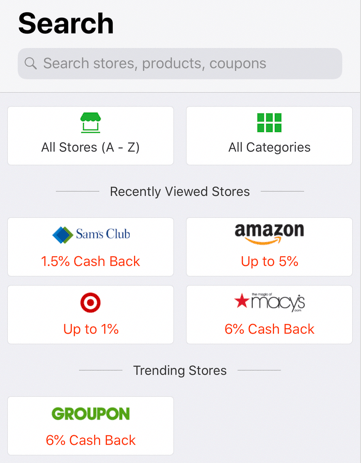 Go to Ebates website or open the app, log into your account, type in the store you want to shop at, search for the item you want to buy and check out. You do get more cash back using the online/mobile version and there are also more options. Ebates also offers double cash, especially around the holidays. 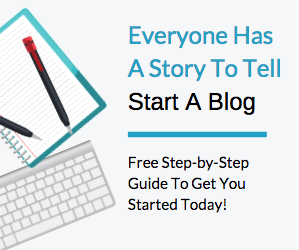 Step 2: At the time of writing this post, you can get up to 5% cash back with Amazon. 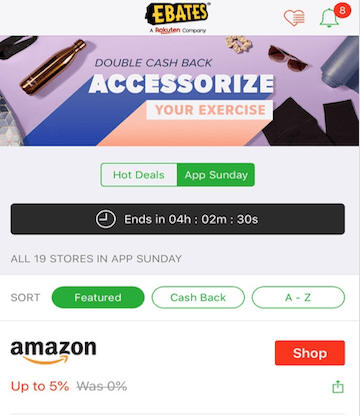 When you click on “Shop”, you will get a list of categories and how much cash back you’d get from each category. Step 3: You will be automatically redirected to Amazon website and you can just start shopping like normal. Easy right? What I like about Ebates is that you don’t have to scan your phone to get cash back at the store. All you have to do is link your credit card with the Ebates app. After it is linked, it is super easy to use. Step 1: Prior to checking out, log into your Ebates app from your phone and search for your store to see if it is there. Step 2: Check to see if it has in-store cash back. Click on “Link Offer” to link it to your credit card. 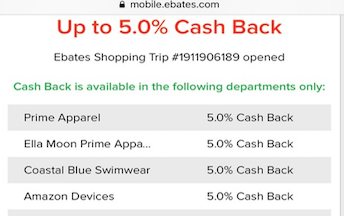 Notice how the In-Store cash back is only 4%, but online cashback is 8%? You can get more money back by shopping online. Step 3: Once it is linked, a message will pop up to let you know that the offer is linked. Step 4: After your purchase, you will receive an email to let you know that your cashback is on its way. 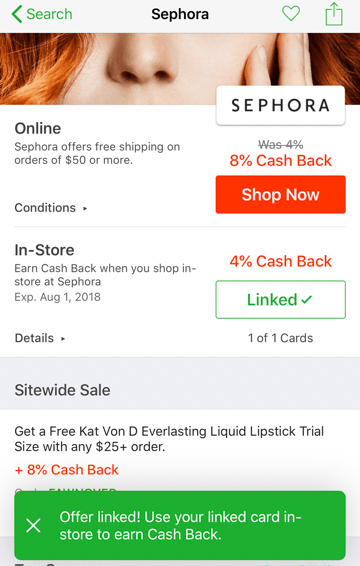 In addition to getting 4% cash back from Sephora, I also got 1% from my bank for using my credit card. It’s practically free with all the cash back. Ok…not really, but you get the idea. 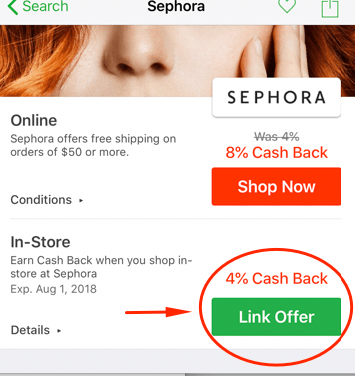 I just showed you 2 ways to save money with Ebates, but that’s not all. 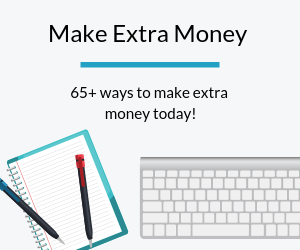 You can also make money with Ebates. Ebates has a refer-a-friend program – which means you get $25 when your friend signs up, your friend also gets $10 for signing up. It’s a win-win situation. Ebates program is definitely legit. I just got paid $125.35 via PayPal.